On Dasher! On Dancer! On Prancer! On Vixen! On Comet! On Cupid! On Donner! On Blizten! Do you recall the most famous reindeer of all? Rudolph of course! In peanut butter cookie, chocolate pretzel and M&M form. 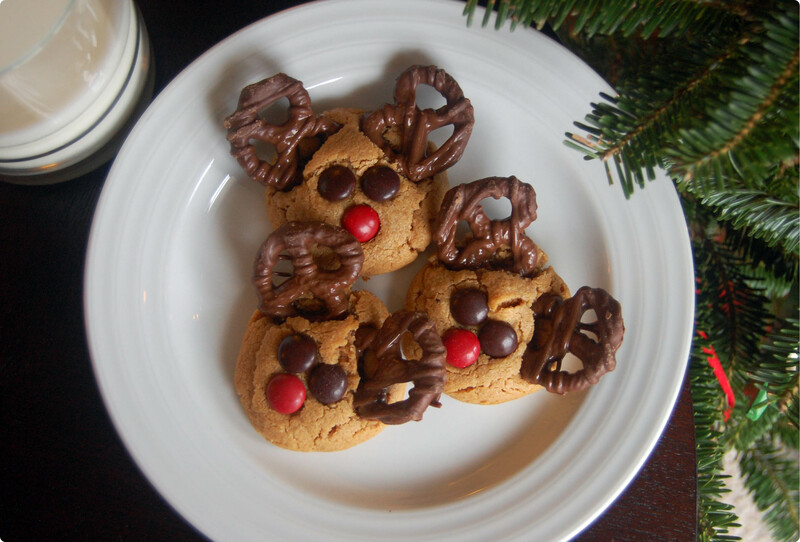 I was inspired to make these reindeer cookies after viewing the old stop animation Rudolph the Red-Nosed Reindeer movie with my son. The slightest bit creepy (if I dare to say) but festive none the less. Lincoln hasn’t stopped talking about reindeer since. 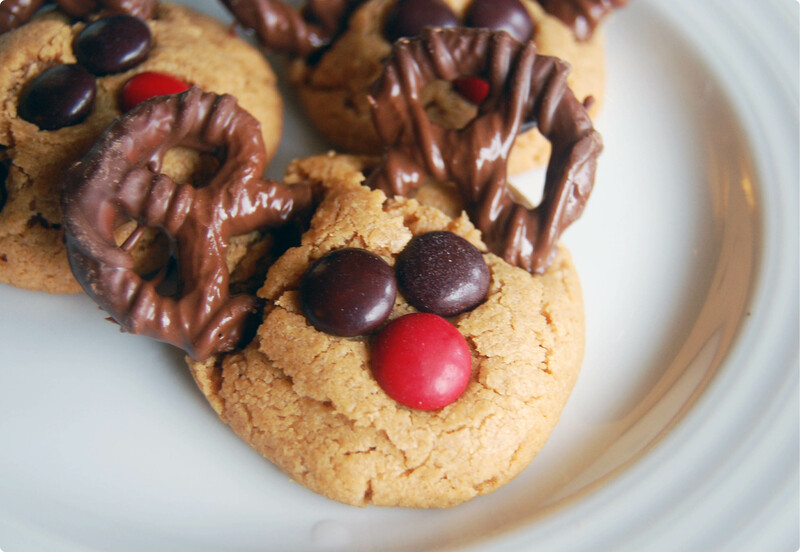 These adorable cookies are easy and fun to make, especially if you have little elves to help. If you don’t feel like making the peanut butter cookies from scratch, you can always use the slice and bake version, they will look just as cute! Preheat oven to 350. Thoroughly mix all ingredients in a mixing bowl. Roll into 1 1/2 inch balls and place on ungreased cookie sheet. Bake for 12-15 minutes. Allow the cookies to sit for one minute after taking cookies out of oven. Then, insert pretzels at a 45 degree angle in the top of each cookie to make ears. (Be careful, the chocolate will melt if it touches the hot baking sheet!) Insert brown M&Ms for eyes and a red M&M for the nose. Once set, move to wire cooling rack to complete cooling. So cute! And who doesn’t love a good PB cookie!? giving your PB cookie recipe a try with Christmas Season….